WebSocket is the primary means of communicating with the SDL component from the vehicle. In a basic example, an HTML5 HMI would use a native WebSocket library to communicate with SDL Core. be installed on the same vehicle HU OS where SDL is installed, or the HMI must be able to be networked to SDL and address it via a static IP address. 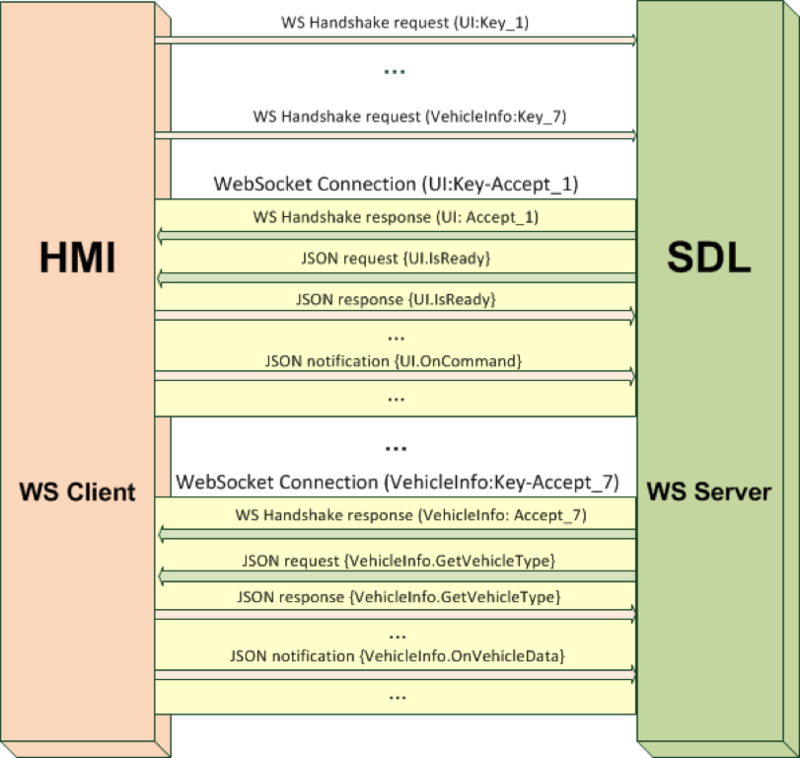 Establish a separate WebSocket connection with SDL for each of components defined in the HMI_API specification. Use the appropriate corresponding connection when sending responses and notifications to any connected component. 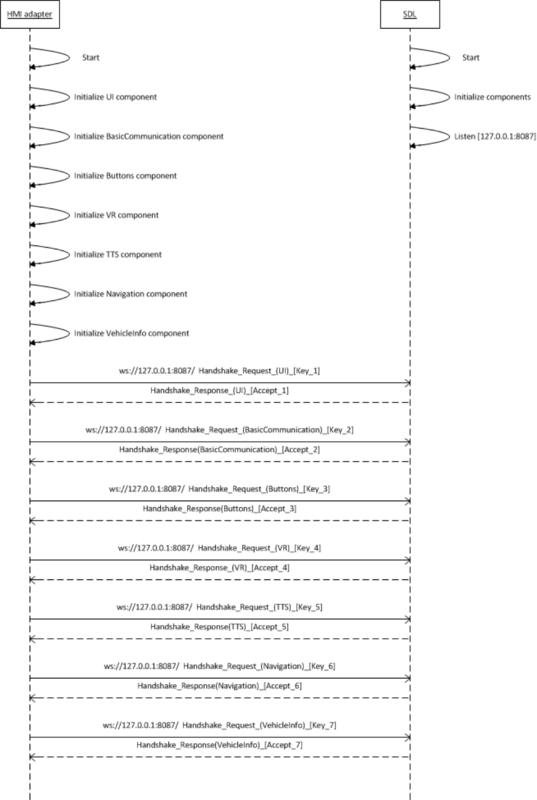 For opening a WebSocket connection, a handshake must be performed. Once all the requested connections are opened, the HMI must send the JSON request for registering each component TODO: (see section 4.2 for JSON format details and Example #4 for registration example). "componentName" The name of the component being registered. Must correspond to the appropriate component name described in the current guidelines. This section describes the message structure for communication between your HMI and SDL. The JSON RPC 2.0 format is taken as a basis. "id" An identifier established by the Client. This value must be of unsigned int type in the frames of communication between your HMI and SDL. The value should never be Null. If "id" is not included the message is assumed to be a notification and the receiver should not respond. "jsonrpc" A string specifying the version of JSON RPC protocol being used. Must be exactly "2.0" currently in all versions of SDL. "method" A String containing the information of the method to be invoked. The format is [componentName].[methodName]. "params" A structured value that holds the parameter values to be used during the invocation of the method. This property may be omitted. "fieldText": "Adverse Weather Conditions Ahead"
The receiver should not reply to a notification, ie no response object needs to be returned to the client upon receipt of a notification. On receipt of a request message, the server must reply with a response. The response is expressed as a single JSON Object with the following properties. "jsonrpc" Must be exactly "2.0"
"result" Required on Success. Must not exist if there was an error invoking the method. The result property must contain a method field which is the same as the corresponding request, a code field with 0 to indicate success. No other result codes can be sent in the response object. The result property may also include additional properties as defined in the HMI_API. When an RPC encounters an error, the response object must contain the error property instead of the result property. "error" Required on error. Must not exist if there was no error triggered during invocation. The error field must contain a code field with the value that indicates the error type that occurred (TODO: Result Enumeration section 5.1.1), a message field containing the string that provides a short description of the error, and a data field that must contain the method from the original request.